Sir Harry Ricardo as seen in 1955 at age 70. 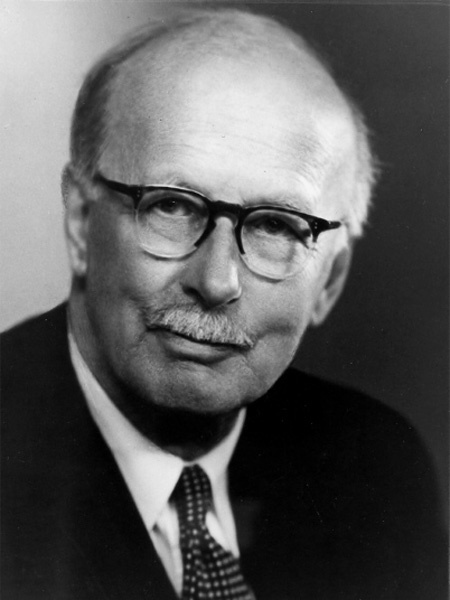 Sir Harry Ricardo (26 January 1885 – 18 May 1974) was one of the foremost engine designers and researchers of the internal combustion engine. During the First World War, Ricardo designed significantly improved engines for early British tanks. Between the wars, he researched the physics of internal combustion and the design of combustion chambers. This work led to the use of octane ratings, stratified charge, and intake swirl (vortex). Ricardo was instrumental in the development of the sleeve valve engine, particularly for aircraft use. His work and research contributed greatly to the high-power aircraft engines of World War II. After the war, he continued to develop the Diesel pre-combustion chamber (Comet), originally designed in the 1930s, which made high-speed diesel engines possible. The following excerpt is from a lecture Harry Ricardo gave to the Royal Society of Arts on 23 November 1931. I am going to take the rather unconventional course of asking you to accompany me, in imagination, inside the cylinder of a diesel engine. Let us imagine ourselves seated comfortably on the top of the piston, at or near the end of the compression stroke. We are in complete darkness, the atmosphere is a trifle oppressive, for the shade temperature is well over 500 Celsius – almost a dull red heat – and the density of the air is such that the contents of an average sitting-room would weigh about a ton; also it is very draughty, in fact, the draught is such that, in reality, we should be blown off our perch and hurled about like autumn leaves in a gale. Suddenly, above our heads, a valve opens and a rainstorm of fuel begins to descend. I have called it a rainstorm, but the velocity of droplets approaches much more nearly that of rifle bullets than of raindrops. For a while nothing startling happens, the rain continues to fall, the darkness remains intense. Then suddenly, away to our right perhaps, a brilliant gleam of light appears, moving swiftly and purposefully; in an instant this is followed by a myriad others all around us, some large and some small, until on all sides of us the space is filled with a merry blaze of moving lights; from time to time the smaller lights wink and go out, while the larger ones develop fiery tails like comets; occasionally these strike the walls, but, being surrounded by an envelope of burning vapour, they merely bounce off like drops of water spilt on a red hot plate. Right overhead all is darkness still, the rainstorm continues, and the heat is becoming intense; and now we shall notice that a change is taking place. Many of the smaller lights around us have gone out, but new ones are beginning to appear, more overhead, and to form themselves into definite streams shooting rapidly downwards or outwards from the direction of the injector nozzles. Looking round again we see that the lights around are growing yellower; they no longer move in a definite direction, but appear to be drifting listlessly hither and thither; here and there they are crowding together in dense nebulae, and these are burning now with a sickly, smoky flame, half suffocated for want of oxygen. Now we are attracted by a dazzle, and looking up we see that what at first was cold rain falling through utter darkness, has given place to a cascade of fire as from a rocket. For a little while this continues, then ceases abruptly as the fuel valve closes. Above and all around us are still some lingering fire balls, now trailing long tails of sparks and smoke and wandering aimlessly in search of the last dregs of oxygen which will consume them finally and set their souls at rest. If so, well and good; if not, some unromantic engineer outside will merely grumble that the exhaust is dirty and will set the fuel valve to close a trifle earlier. So ends the scene, or rather my conception of the scene, and I will ask you to realise that what has taken me nearly five minutes to describe may all be enacted in one five hundredth of a second or even less. 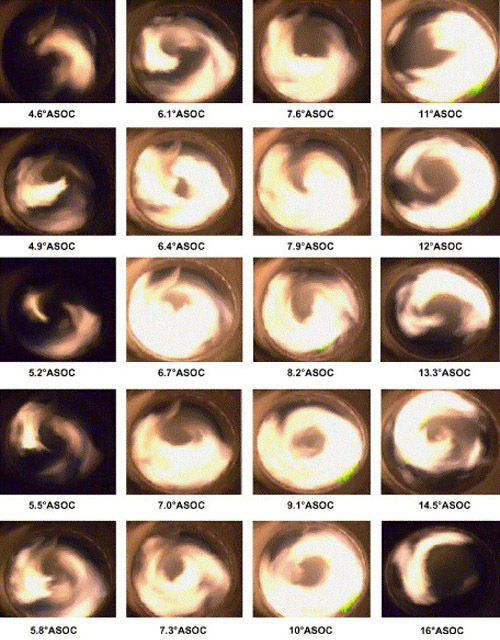 View of a diesel combustion chamber showing the combustion sequence (ASOC: After Start of Combustion). This entry was posted in Aircraft Engines, Automotive, Diesel Engines on 2 January 2013 by William Pearce. Hello, the above is truly fascinating to me. From memory, Siemens did a large amount of research in the late 80’s. 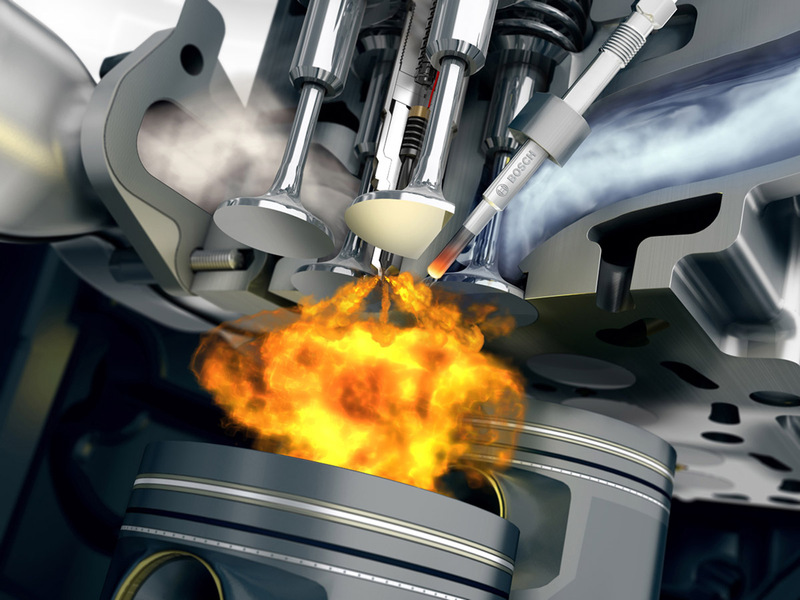 They used new methods of high-speed photography to capture what really happens during the injection/ignition/combustion events in a high-speed diesel. Although the research was valuable, it also merely confirmed what Ricardo said was happening about 45 years earlier. Please could you add a link to where I could read the complete lecture? Thank you very much Donald Simpkin. I’m glad you liked the article; Harry Ricardo was one of a kind. I have not been able to find the entire lecture. I will keep an eye out for it and let you know if I find it.